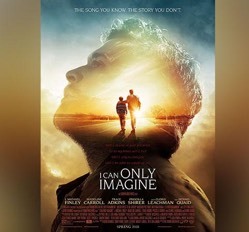 The Christian-themed "I Can Only Imagine" beat out Disney's "A Wrinkle in Time," a movie which had all of its original Christian elements removed by the screenwriter. It also beat a new film about a gay teenage romance. The movie tells the story of Bart Millard, the lead singer of Christian rock band MercyMe, and what led him to write the bestselling Christian single of all time: "I Can Only Imagine." Millard told CBN News in Nashville, following the film's premiere, that the filmmakers did a great job capturing the heart of his story. "The first time I saw it, it was really emotional," he said. "I guess they did a good job because they stirred some emotions that I spent most of my life trying to bury." The film earned nearly double its expected outcome raking in $17.1 million across North America. It came in third for the weekend behind the opening of "Tomb Raider" and Marvel's "Black Panther." "Tomb Raider" had a $94 million production budget while "I Can Only Imagine" had a tiny $7 million budget by comparison. And "I Can Only Imagine" only played in 1,629 theaters, making the $17.1 million earnings even more remarkable. Compare that to "Tomb Raider" which opened in more than twice as many theaters, 3,854, and only beat "I Can Only Imagine" by about $6 million to take second place for the weekend. Meanwhile, "A Wrinkle in Time" is still playing in an incredible 3,980 theaters but hasn't lived up to expectations. Critics believe that's because the prominent Christian themes from the beloved children's novel were replaced by a New Age agenda, as CBN News reported here.